Quite early on in the history of jet fighter aircraft, it was realized that a main vulnerability of jets is their reliance on an airbase and a runway, targets which can comparatively easily be taken out or temporarily disabled in a war, especially as the operational range of most fighters is quite limited and hence the base has to be relatively close to the front. Vertical takeoff and landing (VTOL) ability was seen as a way to overcome this problem in the 1950s, since a VTOL fighter could operate from basically anywhere. The problem of designing a VTOL aircraft is however obvious – such an aircraft needs a thrust to weight ratio above one to lift from the ground with thrust vector pointed downward during takeoff and pointed backward during normal flight. Early designs involved planes landing on their tail (such as the Lockheed XFV-1 or the Ryan X-13 Vertijet), but these planes were difficult to control. Other designs experimented with auxiliary, downward-pointed engines, but their extra weight was found to be impractical in a fighter jet. For a long time the only truly successful design was the Harrier family achieving VTOL due to thrust vectoring nozzles. The Lockheed Martin F-35B is expected to continue the concept of a VTOL fighter in the next millenium. In the Harrier, the jet exhaust passes through four vectoring nozzles surrounding the center of gravity of the plane. These nozzles can be vectored from zero degrees (to the rear) up to 98 degrees (down and slightly forward for deceleration in hover flight). Since there is no airstream in hover flight across any of the control surfaces, the plane is equipped with a reaction control system with a set of extra small thrusters. All in all, the VTOL ability comes at a price – engine maintenance is difficult (the wings have to come off), the plane is difficult to fly and pilots have described it as ‘unforgiving’ and the accident rate has been comparatively high. Nevertheless, the Harrier has been considered a successful fighter design. 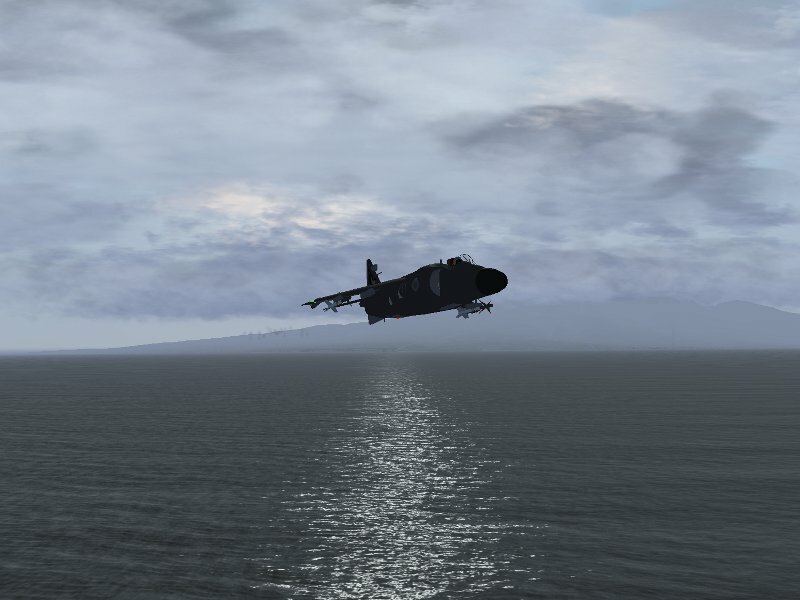 Let’s explore the Harrier in Flightgear! For any VTOL design, weight is a critical consideration. The plane will lift only if the thrust-to-weight ratio is above one, thus with a full fuel and weapons load, the plane is too heavy to lift. For this reason, whenever feasible, the plane is actually used in STOL (short takeoff and landing) mode with thrust only partially vectored down and lift provided partially by aerodynamical lift and partially by downward thrust. In this case, we’d like to do a VTOL takeoff though. With full fuel loadout and two AIM-9L missiles, the plane is still able to lift from the deck of USS Carl Vinson. 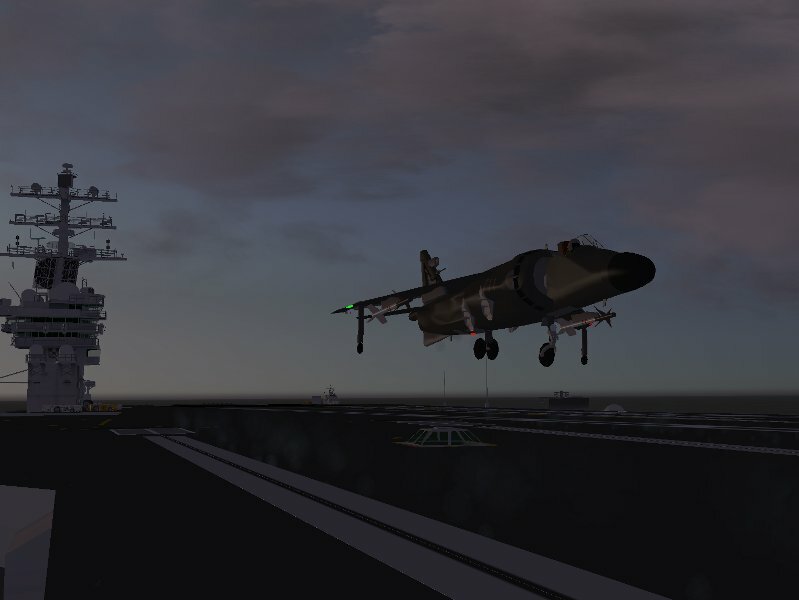 After doing my preflight checks, I vector the thrust about 83 degrees down (the Harrier sits on the gear with the nose pointed up, so if I vector 90 degrees down the plane moves backward on takeoff, which is very dangerous). After releasing the parking brakes, the thrust is slowly increased and the thrust vector corrected such that the plane doesn’t move – now thrust points exactly down. I then increase the thrust until the plane lifts from the deck (this means almost full throttle for the takeoff load), and then, a few meters above the ground vector the thrust very slightly backward to accelerate. The Harrier has a tendency to lift the nose at this point, so I am very careful to push the nose down early on. As the plane accelerates, I vector the thrust more and more back and retract the gear, and within a few seconds the plane accelerates to above 100 kt and less and less downward thrust is needed. 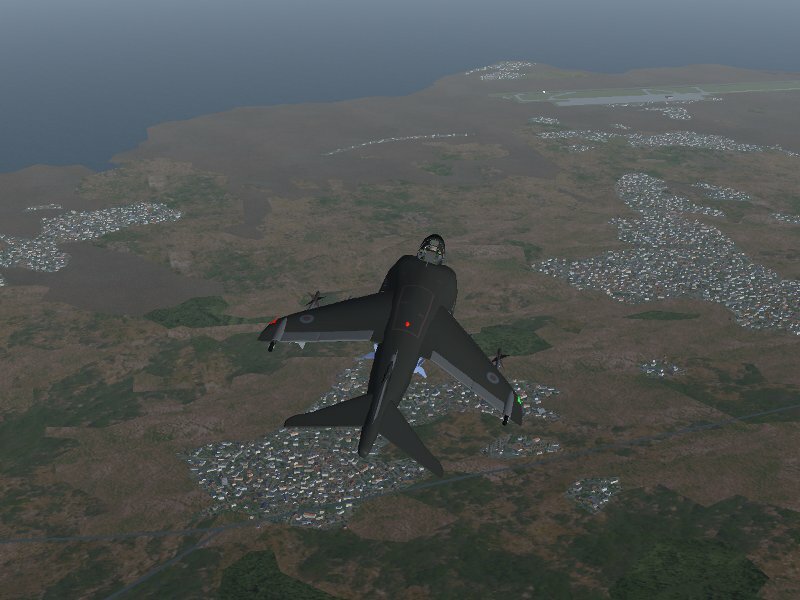 At around 240 kt, I vector the thrust completely back and the Harrier reacts like a normal fighter jet. It is important to remember to reduce thrust at this point – the Harrier has a very powerful engine due to the need to lift, but it is also a very fuel-consuming engine, and in horizontal flight with full thrust it won’t go anywhere before the tanks are empty. Once in the air, the Harrier is a fairly typical older-generation fighter jet – it has a high roll rate, a fairly small turn radius and can climb quickly to high altitude. Lacking an afterburner, it is (despite the powerful engine) not a supersonic plane. Also, without thrust vectoring the plane doesn’t handle too well at slow airspeeds and cannot compete with swept-wing designs like the F-14b. However, thrust vectoring can be used in maneuvering to suddenly decelerate the plane by vectoring the thrust forward or to achieve a very tight turn radius. The Harrier can also land like a conventional fighter jet, in this case vectoring the thrust about 45 degrees down acts like extra flaps – the plane slows down as the backward thrust is reduced and gets extra lift from the downward thrust component. 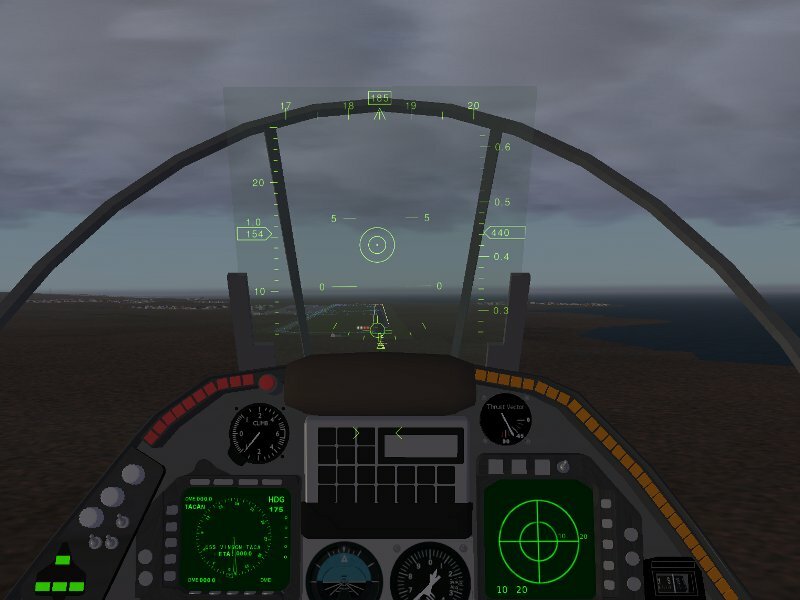 The current cockpit of the Flightgear Harrier could clearly use some attention, it has rather basic texturing, not all instruments are implemented and all in all it tends to be the least realistic visual element in the scene. In flight planning, it is important to remember that unlike a conventional landing, a vertical landing involves a prolonged period of full thrust, and thus (especially during practice of the VTOL approach) about 20 to 25%% of the total fuel load should be available for the landing. Despite some similarities to helicopter flight, it should be remembered that the Harrier is not a helicopter and reacts somewhat differently. First of all, torque generated by the main rotor is a big issue for helicopters and needs to be compensated for, but torque is absent for a jet engine – the Harrier does not in itself develop a tendency to yaw when lifting off the ground. However, the roll stability is dramatically different in hover flight. One can think of a helicopter as the mass of the helicopter body hanging underneath the lifting rotor. Thus, when the body of the helicopter starts to roll, it has a tendency to swing like a pendulum underneath the rotor, but the roll doesn’t grow by itself. In contrast, the Harrier is a mass balanced upon a column of lifting thrust, so any roll tendency will not lead to a pendulum motion but will be self-reinforcing, and if it is not corrected will lead to an unstable condition. 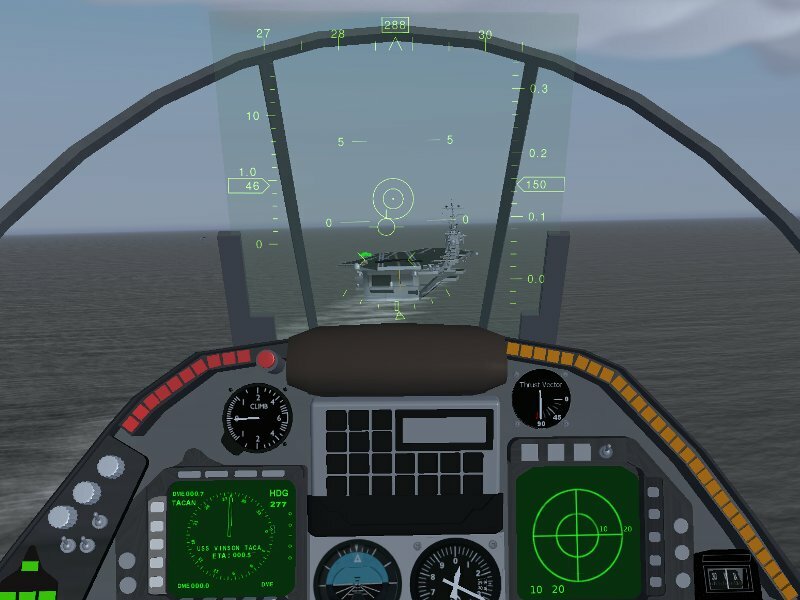 An unstable situation however is worse in the Harrier than in a helicopter since a helicopter pilot has more options – since a helicopter pilot can use the cyclic control to tilt the rotor to the side and well as forward/backward (and so also fly the helicopter sideways or backward). The Harrier can vector thrust only backward or down, but not to the side, i.e. it can not easily be flown sideways and has limited control over unstable situations. Finally, on a more prosaic note, the view down is much worse in the Harrier than in many helicopter cockpits. For all these reasons, it is safer to land with a small forward velocity (which can quickly be reduced on the ground) than to touch down actually without any forward velocity. 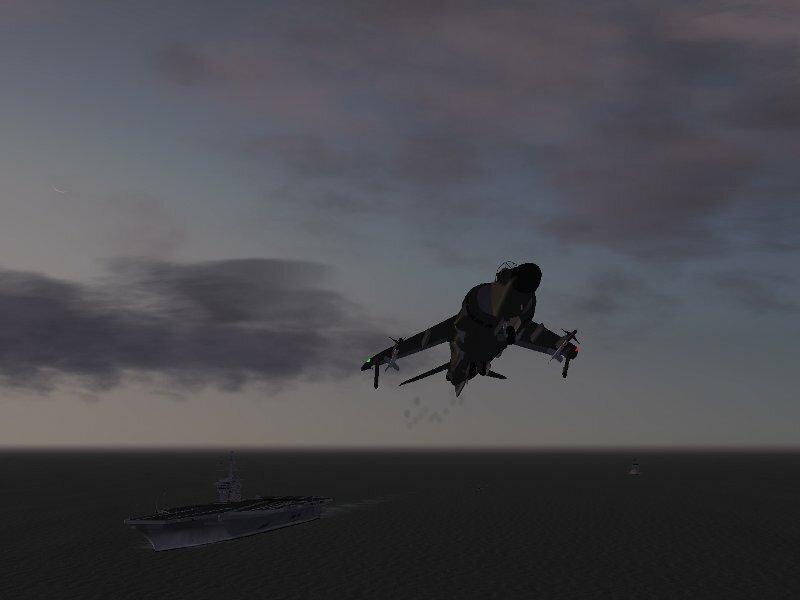 I fly pretty much a conventional approach till about 10 miles distance to the carrier. At this point I reduce the airspeed to 250 kt and start to get flaps out. I put throttle to idle and vector the nozzles down to 90 degrees. As the plane slows down due to drag, about below 200 kt the aerodynamical lift reduces significantly and I keep increasing throttle to compensate. Below 150 kt, I extend the gear. 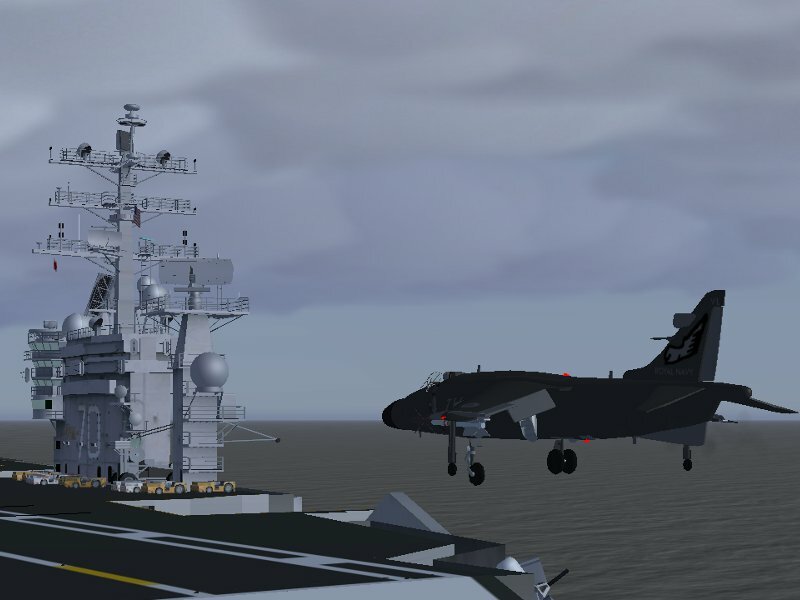 As the carrier gets closer, I aim to reduce the airspeed to about 50 kt – since the Carrier moves with about 15 kt, that gives me some 35 kt relative motion to the carrier, enough to keep the approach stable. I vector thrust slightly forward and backward from the 90 degree position to adjust airspeed and monitor throttle to control my descent rate. At 50 kt airspeed, there is no significant aerodynamical lift left, so the plane hovers under almost full thust slowly towards the carrier. It is important to monitor both airspeed and descent rate at this point – if the airspeed drops too much, the reduction of the small remaining lift component means that I descend too fast and get below the flight deck. In addition, in this stage of the approach wind gusts are felt quite badly and can ruin the whole approach if the plane does not have enough forward motion. Compared to a carrier landing in the F-14b, it feels as if the Harrier approaches the flight deck centimeter by centimeter, although at this point there are about 20 kt relative motion. I keep the nose of the Harrier level with the horizon and pull it up to 8 degrees only after I am above the flightdeck – this effectively vectors thrust forward and kills my remaining airspeed, this in turn reduces lift and combined with a slight decrease in throttle lets me touch down with a forward motion of less than 10 kt, which I kill by applying brakes while I push the throttle quickly to idle to let the plane settle down firmly and avoid being thrown by a sudden gust. As can be seen here, the Harrier rests in a slightly unusual configuration with the nose pointing upward. Clearly, the Harrier is not one of the most detailed aircraft available in Flightgear. However, it provides a good, solid hands-on understanding of the advantages and problems of the VTOL concept. 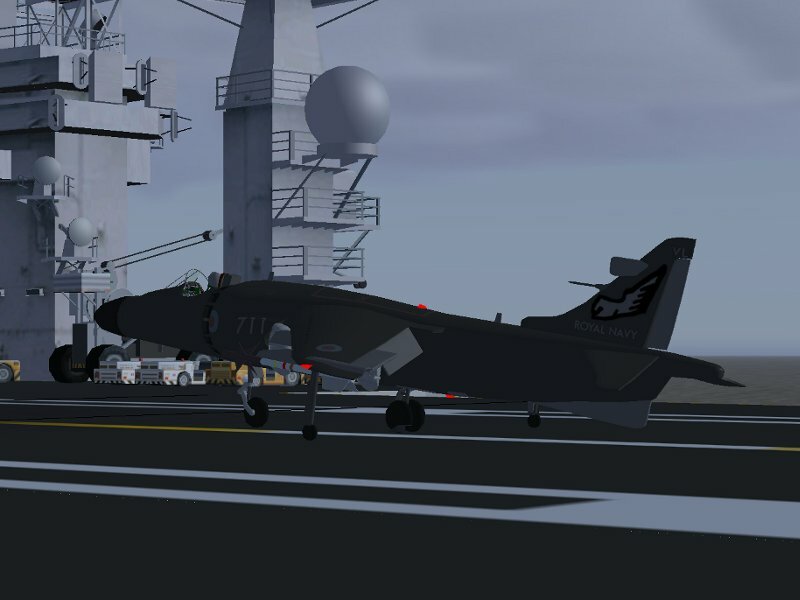 Other versions of the Harrier can be found in the Flightgear UK hangar. 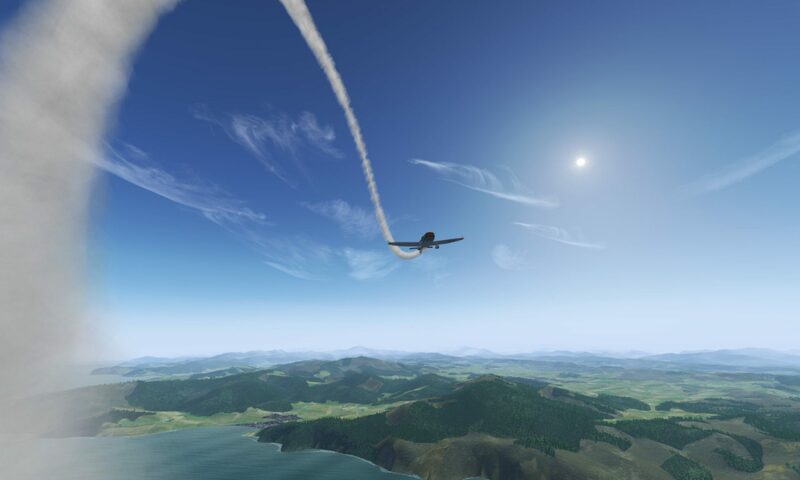 The above screenshots have been made with the development version of Flightgear using lightfield shading and the environment-sensitive detailed water shader.